The Gallery is delighted to present an exhibition of new works by Michael Taylor, one of Australia’s foremost Abstract Expressionist artists. Michael Taylor is one of Australia’s most important contemporary painters. He lives and works in the Monaro where he draws his inspiration from the natural world around him. He paints the landscapes and waterscapes of southeast New South Wales, capturing their rhythms and changing atmospheres. His paintings stand at the junction of landscape and abstraction, though they often appear to melt into total abstraction. Michael Taylor graduated from the East Sydney Technical College, now the National Art School, where he was taught by the eminent artists Ralph Balson and Godfrey Miller. 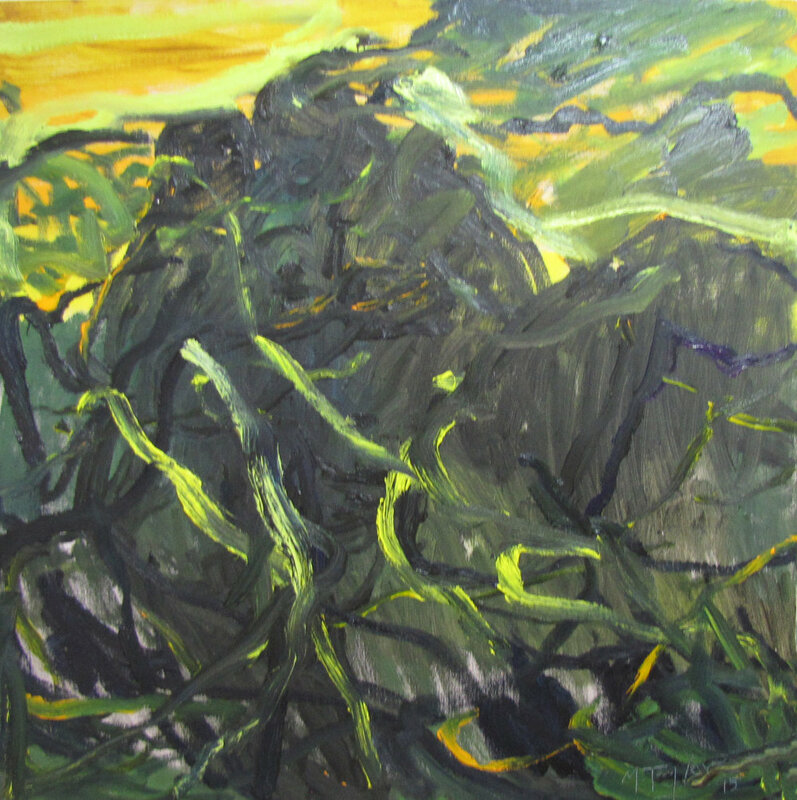 He has been exhibiting regularly since 1963 and has participated in numerous international and Australian exhibitions. He was the subject of a major, 50-year retrospective exhibition at the Canberra Museum and Gallery in 2016. His work is held in a number of important collections including those of the National Gallery of Australia, all the state and regional galleries, as well as university galleries, corporate and private collections. Michael Taylor | New Works opens at the Nancy Sever Gallery on 21 November 2018 and runs until 16 December 2018. For further information please contact Nancy Sever at nancy.sever@iinet.net.au or Tel 02 6182 0055. The Gallery is open Wednesday – Sunday 11am – 5pm. 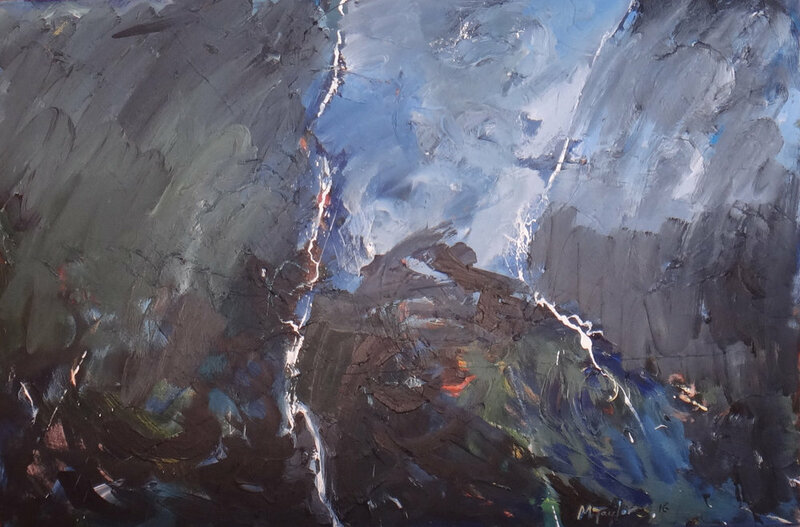 The Nancy Sever Gallery has just relocated to new premises in the Gorman Arts Centre and we are delighted to launch our new space with an exhibition of new paintings by Michael Taylor. Michael Taylor is one of Australia’s most important contemporary painters and he ranks amongst the great interpreters of the Australian landscape. He lives and works in the Monaro where he draws his inspiration from the natural world around him. He paints the landscapes and waterscapes of southeast New South Wales, capturing their rhythms and changing atmospheres. His paintings stand at the junction of landscape and abstraction, though they often appear to melt into total abstraction. As Sasha Grishin has observed, “Taylor is a rare example of an artist with a romantic sensibility who got better as he got older…..(his) paintings are a source of revelation and inspiration”. His work is held in a number of important collections including those of the National Gallery of Australia, all the state and regional galleries, university galleries, and corporate and private collections. The exhibition was opened by Deborah Clark, Senior Curator, Visual Arts, Canberra Museum and Gallery, who curated a major, 50-year retrospective exhibition of Michael Taylor’s work at CMAG last year. Following a major, critically acclaimed survey exhibition of his work at the Canberra Museum and Gallery, Michael Taylor has a show of new work at the Nancy Sever Gallery. Michael Taylor is one of Australia’s most important major contemporary painters. He lives and works in the Monaro where he draws his inspiration from the natural world around him. He paints the landscapes and waterscapes of southeast New South Wales, capturing their rhythms and changing atmospheres. His paintings stand at the junction of landscape and abstraction, though they often appear to melt into total abstraction. 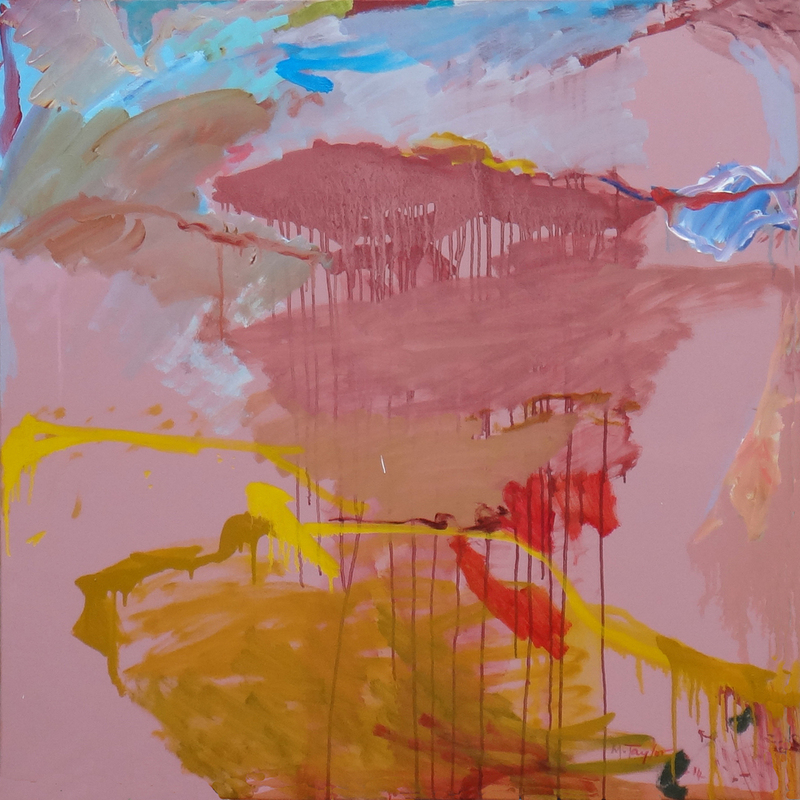 The artist has revised and adapted his gestural abstraction over the years so as to maintain it as his own instantly recognisable visual language. His work is held in a number of important collections including those of the National Gallery of Australia, all the state and regional galleries, as well as university galleries, and corporate and private collections. The exhibition was opened by Deborah Clark, Senior Curator, Visual Arts, Canberra Museum and Gallery and curator of the exhibition Michael Taylor: a survey 1962-2016. The Gallery was delighted to present an exhibition of paintings and etchings by Michael Taylor, one of Australia’s foremost Abstract Expressionist artists. Michael Taylor was born in 1933. In 1953 he was awarded a diploma in painting from the East Sydney Technical College, now the National Art School, where he was taught by eminent artists Ralph Balson and Godfrey Miller, among others. He has been exhibiting regularly since 1963 and he has participated in numerous international and Australian exhibitions. His work is held in a number of important collections including those of the National Gallery of Australia, all the state and regional galleries, as well as university galleries, corporate and private collections. Michael Taylor lives and works in the Monaro, NSW. He draws his inspiration from the natural world around him. He paints the landscapes and waterscapes of southeast New South Wales, capturing their rhythms and changing atmospheres. His paintings stand at the junction of landscape and abstraction, though they often appear to melt into total abstraction. The exhibition was be on display from 15 April to 24 May 2015 at the NANCY SEVER | GALLERY, 4/6 Kennedy Street, Kingston. 1933 Born at Sydney, NSW. 1949-53 Diploma in Painting, East Sydney Technical College. 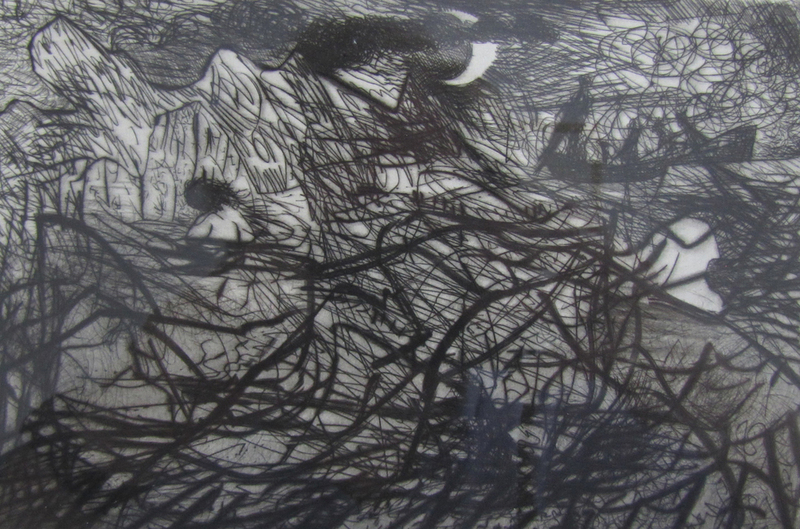 1960 Awarded a NSW Travelling Art Scholarship. 1974-75 Travelled to New York, Europe and India. 1975 Third Triennale, Delhi, India. 1979 Creative Arts Fellow, Australian National University. 1988 Joye Art Foundation, Paddington. 1990 Visited Noumea for L’art contemporain australien. 1971-2015 Lives and works on the Monaro. NSW. 2011. Michael Taylor, Gallery 9, Sydney. 2009. Collage, Gallery 9, Sydney. 2007. Michael Carr Art Dealer, Sydney. 2006. Exhibition Swing (Collages by Michael Taylor), Canberra Museum and Gallery, ACT. 2004. Michael Carr Art Dealer, Sydney. 2000. Michael Carr Art Dealer, Sydney. 1990. Yuill Crowley Gallery, Sydney. 1990. Flinders Lane Gallery, Melbourne. 1989. Yuill Crowley Gallery, Sydney. 1988. Rex Irwin Art Dealer, Sydney. 1987. 312 Lennox Street, Melbourne. 1986. Rex Irwin Art Dealer, Sydney. 1984. Rex Irwin Art Dealer, Sydney. 1976. Anna Simons Gallery, Canberra. 1975. Joseph Brown Gallery, Melbourne. 2012. Abstraction II. Charles Nodrum Gallery, Melbourne. 2011. Modern Australian Painting. Charles Nodrum Gallery, Melbourne. 2009. Paintings 1964-83. Campbelltown Arts Centre, Sydney. 2008. Reflections, Canberra Museum and Art Gallery. 2005. Moist, National Gallery of Australia and touring Australian Regional Galleries. 2004. Fireworks, touring Australian Regional Galleries. 2003. The big river show, Wagga Wagga Art Gallery. 2000. The Antipodeans, National Gallery of Australia, Canberra. 1999. Living in the seventies, Canberra Museum and Gallery. 1997. I had a dream, National Gallery of Victoria, Melbourne. 1996. First Canberra Drawing Biennale, Drill Hall Gallery, Canberra. 1996. Clemenger Triennial, National Gallery of Victoria. 1995. The River. Touring exhibition, Victoria. 1995. Hidden Treasures, S H Ervin Gallery, Sydney. 1991. 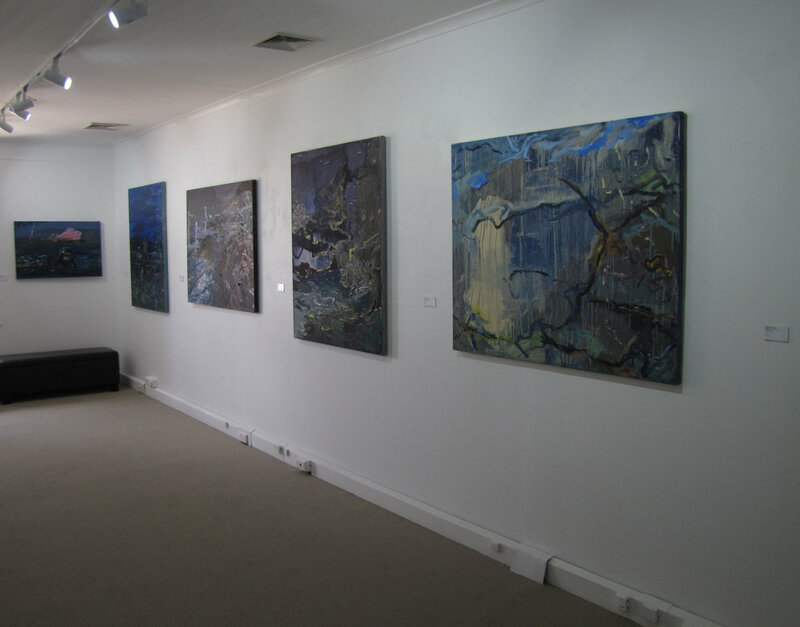 Rivers in Australian art, Heide Park Gallery, Melbourne. 1990. L’Été australien à Montpelier, Montpelier, France. 1988. Drawing in Australia. National Gallery of Australia. 1987. The Age of Collage, Holdsworth Contemporary Gallery, Sydney. 1986. 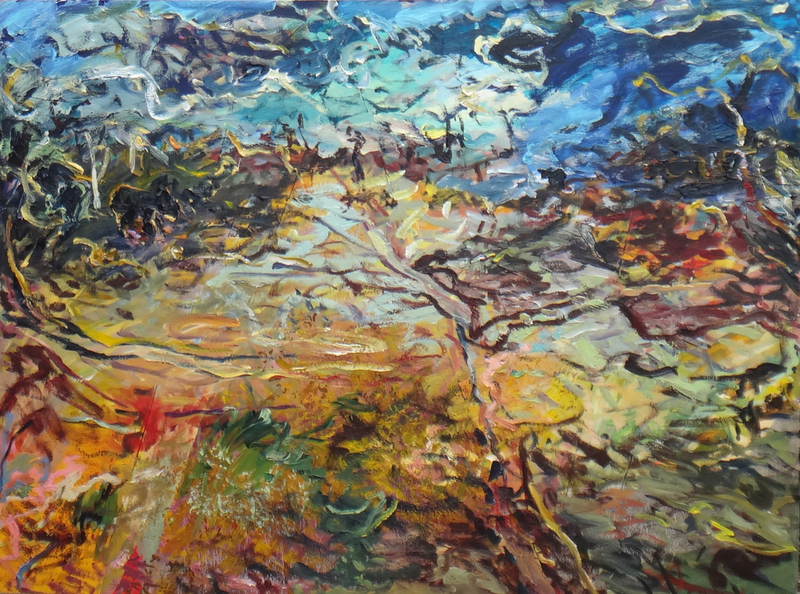 Landscape and Abstraction, Nolan Gallery, Canberra. 1986. Paintings 1955-85, 312 Lennox Street, Melbourne. 1985. The last two decades, Pinacotheca Gallery, Melbourne. 1985. Sydney Art of the Sixties, Gary Anderson Gallery, Sydney. 1982. Landscape Now, Solander Gallery, Canberra. 1982. The Seventies, National Gallery of Victoria. 1981. The Aboriginal Treaty Committee art exhibition, Sydney. 1979. Creative Arts Fellow. Australian National University. 1978. Landscape and Image, Indonesia. 1976. Coventry Collection, Uni of New England. 1973. Contemporary Australian Painting and Sculpture, New Zealand. 1972. The Australian Landscape 1790-1971. Art Gallery of NSW. 1969. Australian Art Today, Southeast Asia. 1966. Tasmanian Art Gallery Exhibition, Hobart. 1966. Helena Rubenstein Exhibition, Adelaide. 1966. Contemporary Australian paintings, Los Angeles. 1965. Contemporary Australian Drawings, Newcastle Young Australian Painters, Japan. 1964. Australian Painting, Nineteenth and Twentieth centuries, Auckland NZ. 1963. Paris Biennale des Jeunes, Paris. New England Regional Art Museum. North Brisbane College of Advanced Education. Taylor's paintings from the 1960s represent the intersection between landscape and abstraction, where observed visual references are usually subsumed as the artist's natural instincts allow the emotional and sensory capacity of paint to dominate. 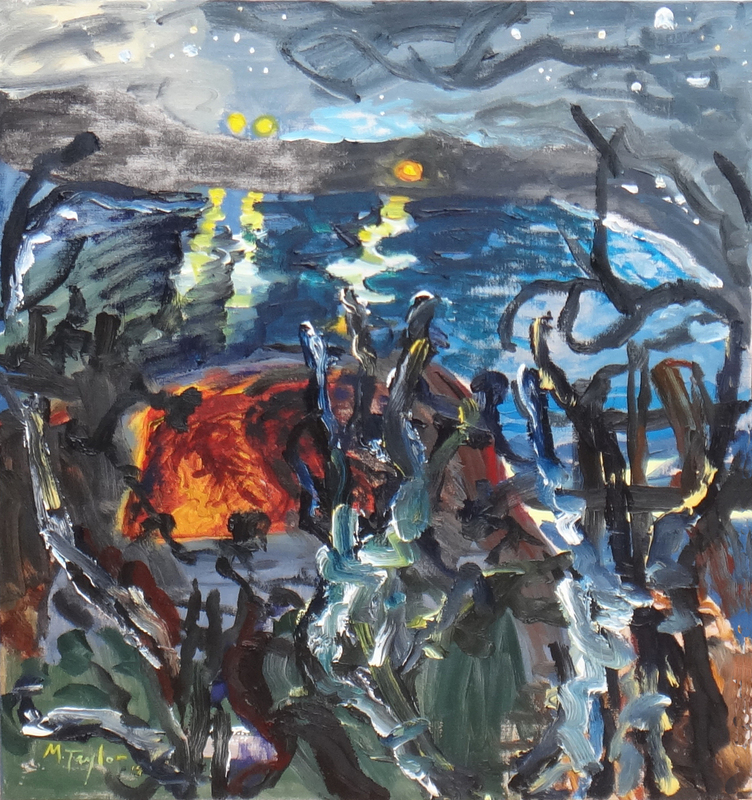 Sydney's offerings for experimental painting in the late 1950s were modest, but Taylor was drawn to Ralph Balson, and artists such as Carl Plate and the dark, gritty European inspired abstractions. 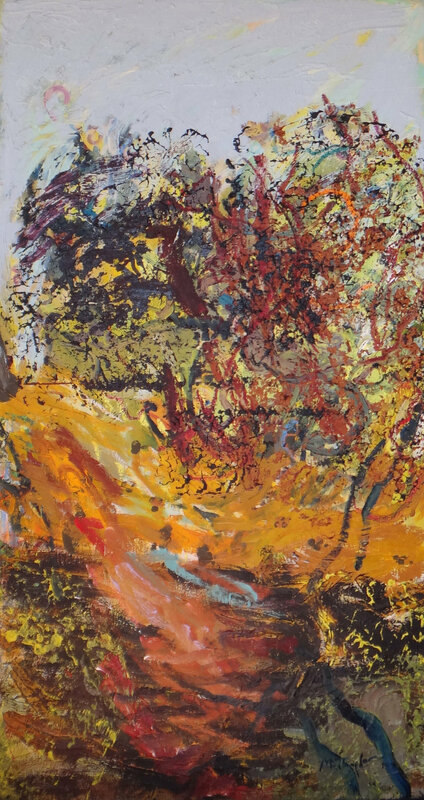 It was a time in which John Olsen emerged with an entirely new pictorial language. 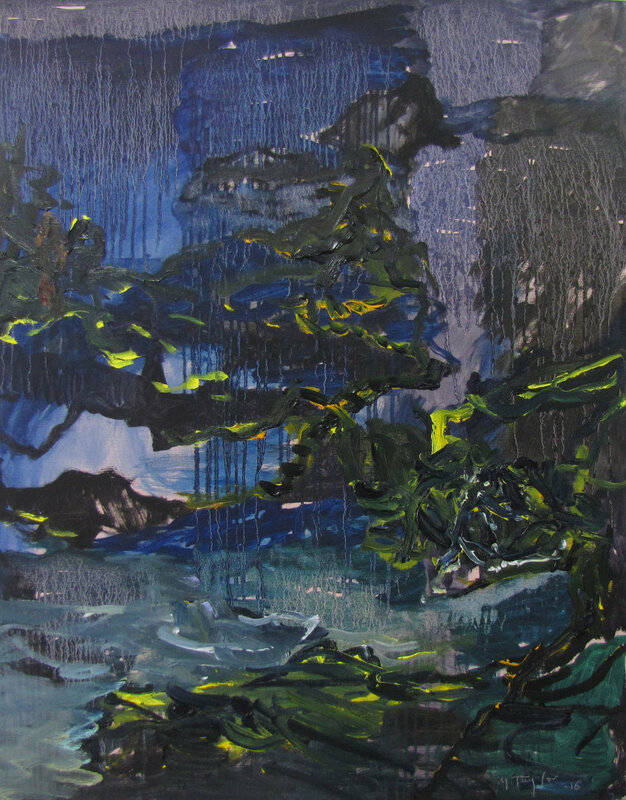 While Taylor's landscape-inspired paintings often appear to dissolve into total abstraction, their wellspring is the artist's experience to his natural world. Nonetheless, so highly regarded is his art that he was included in the National Gallery of Australia's collection-based exhibition, Abstract Expressionism (14 July 2012 - 3 March 2013). Michael Taylor paints the landscapes and waterscapes of southeast New South Wales, capturing its rhythms and changing atmospheres. An eminent Australian painter, Michael Taylor was born in 1933 and lives and works in Cooma NSW. He has been exhibiting regularly since 1963. His work is held in a number of important collections including the National Gallery of Australia, all the state galleries in Australia and numerous regional, institutional and corporate collections including; the Philip Morris collection, BHP Billiton, Artbank, the Joye Art Foundation and the RACV collection. Michael Taylor is one of Australia’s foremost Abstract Expressionist artists. In work after work since the early 1960s, he has meshed feelings for the world around him with dynamic gestural expression. Although Taylor’s art training was largely traditional, he notes that adventurous teachers like Ralph Balson and Godfrey Miller also ‘got a look in’. He attended numerous classes with Balson, one of the most gifted abstract artists working in Sydney at the time. Taylor recalls that it was very hard to see good reproductions of abstract art, let alone actual works. ‘We used to go to Carl Plate’s bookshop in Rowe Street. 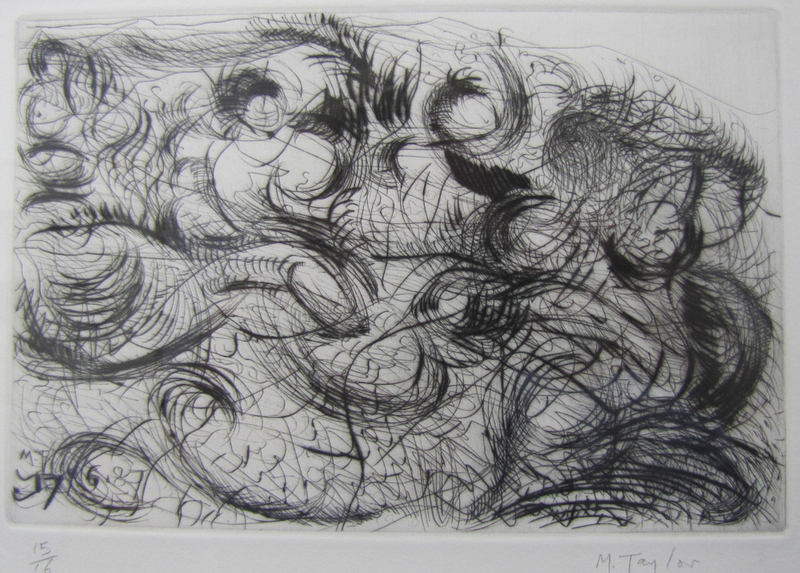 They were mainly little books on abstract art and they were few and far between.’ Apart from artists like Balson, a new way forward was suggested in the 1950s with the exhibition Direction 1 which, Taylor recalls, caused ‘quite a stir’. 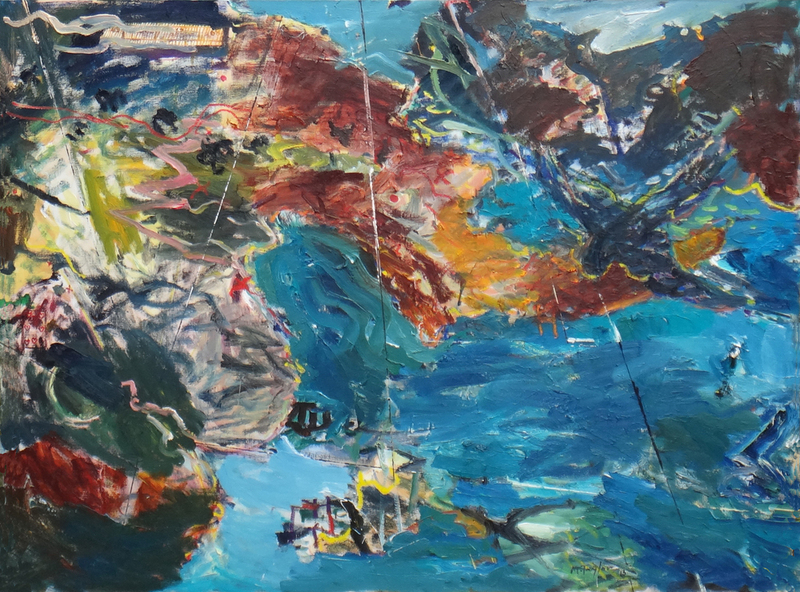 The work of Australian artists such as John Olsen, Robert Klippel and William Rose suggested a new freedom of expression, directions which came not from the Americans but from European artists of the School of Paris like Alfred Manessier, Vieira Da Silva and Jean-Paul Riopelle. Taylor also absorbed influences from further afield. As part of his New South Wales Travelling Scholarship, awarded in 1960, he stayed for a time in England and then spent most of his three years away in Europe. 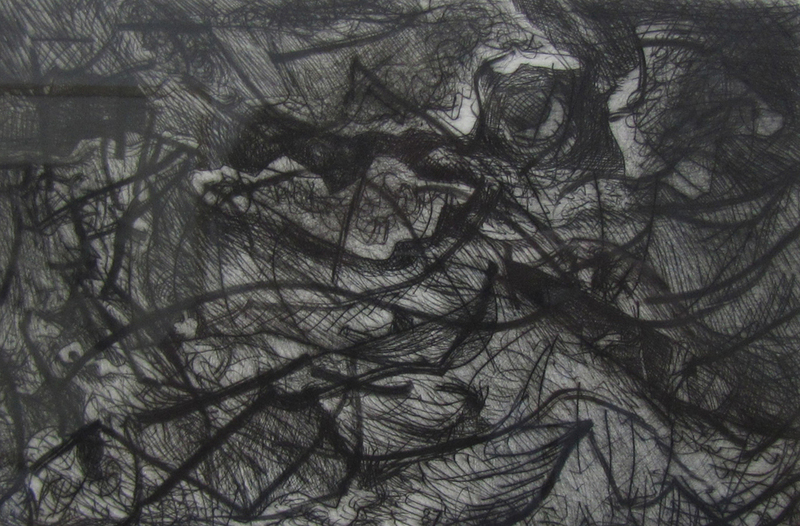 He recalls seeing his first works by Willem de Kooning in London, as well as some early Jackson Pollock paintings in travelling exhibitions at this time. Later, canvases ……. were seen to reflect aspects of Taylor’s interest in Spanish art and culture. As Daniel Thomas observes: “During his European studies Spain was where he was most at home. Spain is the country of black painting, of fiercely aristocratic, impersonal passion, the country of Velasquez and Goya and, in our time, of Tapies …The best black paintings aren’t dead black, they give their darkness a velvety glow, lights shine like silver, tender touches of pink hint of sensuous flesh … Underneath the extreme, dignified reserve of black, there may lurk a passionate sensualist. 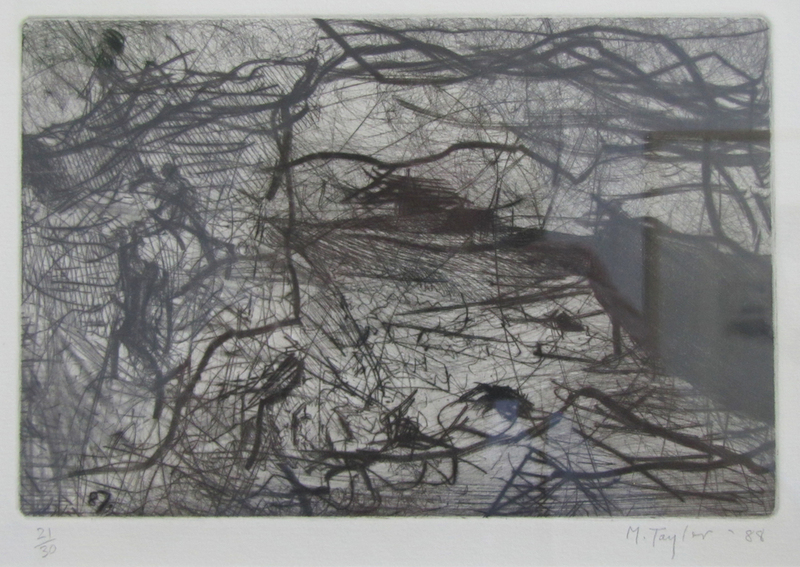 Michael Taylor has been rated as one of the great interpreters of the Australian landscape. Now in his early eighties, with dozens of solo exhibitions under his belt and his work held in every major Australian Gallery, the artist hasn’t slowed down. Currently on display are more than twenty of Taylor’s joyful abstract paintings, all made over the past 12 months. 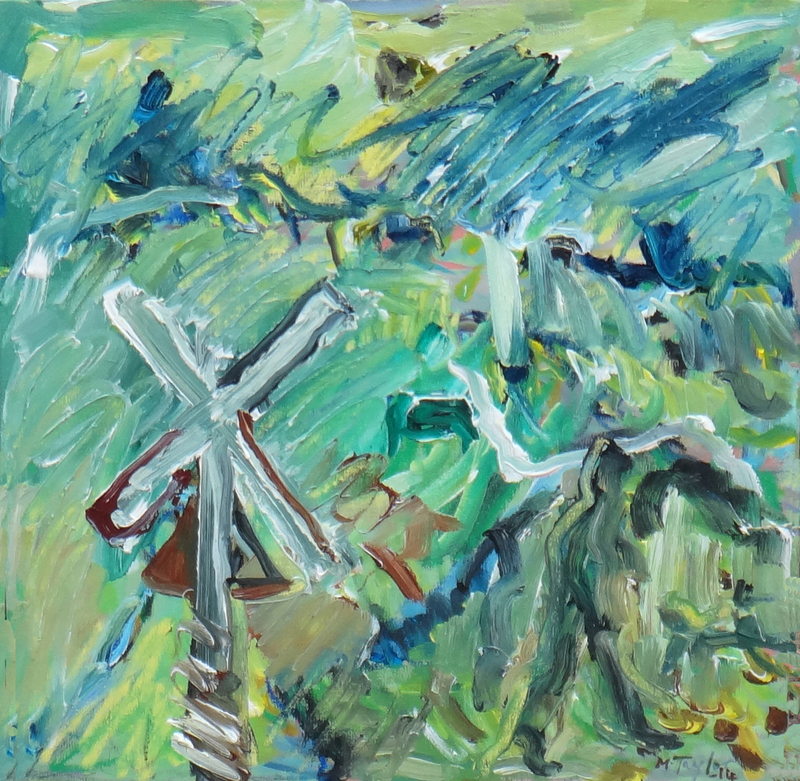 The bush and coastal landscapes surrounding his home in the small town of Cooma in south-eastern NSW provide Taylor with ample material for these expressionist-style oil paintings made in his characteristic lyrical style. Perhaps less spare in colour and appearance than much of his early work from the 60s and 70s, the paintings carry an appeal to the emotions. Of course there’s the telltale palette, but everything else is conveyed by the paint itself. Sweet sounding bush melodies harmonise with Taylor’s symphonic blue odes to the sea and the rhythmic lapping sounds of his dark river landscapes. Bright days, moonlit nights and early mornings are all captured with aplomb.